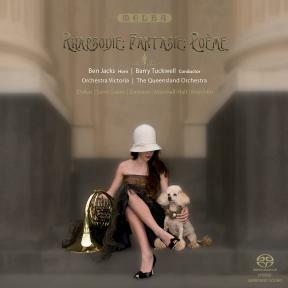 A sparkling recording of French and Australian works for French horn and orchestra featuring acclaimed horn soloist, Ben Jacks, with Orchestra Victoria and The Queensland Orchestra conducted by Barry Tuckwell, the grand eminence of the horn. The title track Rhapsodie, by contemporary French composer, Jean-Michel Damase was commissioned by the famous satirist Barry Humphries for Barry Tuckwell and was first performed by him as soloist in 1987. This is the world premiere recording of this work. Also included are world premiere recordings of the Damase Horn Concerto and Paul Terracini’s superb new orchestral arrangement of Paul Dukas’ popular Villanelle, especially commissioned for this CD and all recorded to Melba’s exacting standards. In addition there is the well-known Morceau de Concert pour cor et orchestre, Op.94 by Saint-Saëns, the world premiere recording of the Phantasy for horn and orchestra by Australian composer, G.W.L. Marshall-Hall (1905), the first Australian horn concerto written, and Koechlin’s sensuous Poème pour cor et orchestre, Op.70bis. 'I knew Barry Tuckwell through his sister, Patricia. Known, to her great embarrassment I’m sure, in the old days, as Bambi Shmith. She was married to a wonderful photographer Athol Shmith. She herself was an accomplished violinist with the MSO. Now she’s the Countess of Harewood, and along with her husband Lord Harewood, is involved in many, many musical events. But through her I got to know her brother, Barry, and she calls him ‘the other Bazza’. I’ve always been a big fan of Barry Tuckwell’s. I love the horn as an instrument. I heard quite by accident in Los Angeles in the ‘70s a recording of some music by this composer Jean-Michel Demase. It was very much sort of in the Poulenc, Jean Françaix tradition. I tried to find more music by this very engaging composer and I found he was still alive and teaching at the Conservatoire in Paris. He was a very modest man. He had a big reputation as a protégée. He was the son of a famous harpist. He wrote a lot for harp, a lot for strings and a lot of music for flute. I wrote to him and asked would he accept a commission. I’d never done this before. It was an impertinence really.I was thinking of my friend Barry Tuckwell in particular. So I went to Paris and asked him (Damase) if he would write a piece for orchestra and horn for Barry Tuckwell. Which he did, gladly. A side effect of the French Revolution was the foundation in 1795 of the Paris Conservatoire, an institution intended originally to train musicians for the National Guard. The Conservatoire rapidly evolved into Europe’s leading centre for training instrumentalists, and developed a particular tradition of excellence in teaching of the horn. A side effect of the Industrial Revolution was the invention of valves designed to regulate the flow of gas in a tube, and it was not long before such technology was applied to brass instruments. German-speaking countries adopted the valve horn relatively soon after it was patented in 1818 but so strong were the traditions of the Paris Conservatoire, and so expert the players it produced, that the valveless “hand” horn continued to be taught there until the early years of the 20th century. The advantage, they felt, was that hand-stopping – the technique of moving the hand in the bell of the instrument to obtain different pitches – produced a wider range of tone colours than was possible on the valve horn. While this argument held good in the early part of the 19th century, composers’ increasingly chromatic lines eventually began to cause problems for players who had chosen not to use valves. Henri Chaussier, who had himself won first prize for hand horn playing at the Conservatoire in 1880, responded to the problem by developing the “omnitonic” horn. This could change keys instantly but still allowed the player to use hand horn technique and, after publishing a description of the instrument in 1889, Chaussier took part in a musical trial in 1891 in which he pitted his omnitonic horn against a valve horn and a hand horn. The compromise instrument won the day with nine votes in favour and one abstention but none of the other horn players in Paris showed any interest in it. It is possible, however, that the omnitonic horn was the instrument which Camille Saint-Saëns had in mind when he wrote the Morceau de Concert (track 10) for Chaussier in 1887, for some of its sections are impossible on the natural instrument. This must have been deliberate, for the Romance Op.67 which he had composed for Chaussier only five years earlier had demonstrated an intimate understanding of the possibilities and limitations of the hand horn. Among the horn players who dismissed Chaussier’s experiments was François Brémond, the horn professor at the Conservatoire from 1892. A great hand horn enthusiast, Brémond recognised nonetheless that its days were numbered and in 1903 he ruled that competitors in the Conservatoire’s annual competition should play their test pieces exclusively on the valve horn. A further innovation was to ask established composers, rather than horn players, to write the test pieces and in 1906 Paul Dukas demonstrated a comprehensive understanding of the requirements of the competition in his Villanelle or Rustic Song (track 9). This piece exploits every facet of the horn player’s technique, with rapid legato and staccato passages, sustained playing, scales and arpeggios, low register work, muted and hand-stopped effects and a top C at the end. The first section, which is marked “sans les pistons” (“without valves”) also illustrates the requirement that the Conservatoire’s test pieces demonstrate hand horn technique. No doubt he also wanted to evoke a more primitive sound for this “rustic” piece – though in all other respects this is a highly sophisticated composition, with obvious debts to Rimsky Korsakov and foretelling the close motivic play Paris was to hear within a few years in the ballets of Igor Stravinsky. Like the Morceau de Concert, the accompaniment was originally written for piano and later orchestrated but Dukas was supremely self-critical and the orchestration was one of many works which he subsequently destroyed. Arranger Paul Terracini has taken great care to replicate the characteristic orchestral colours of the composer in producing this new version. Three years older than Dukas, George William Lewis Marshall-Hall was a London-born composer who studied for a brief time with Sir Hubert Parry at the newly opened Royal College of Music, London. The Royal College, along with the Royal Academy of Music, was an English response to the dominance of the Paris Conservatoire. Marshall-Hall may have lasted only a term, but his talents were such that he soon became a noted teacher of composition and music critic. In 1891 he was appointed the first Ormond Professor in Music at the University of Melbourne, Australia, where he founded in quick succession a conservatorium, and then an orchestra, gaining a first-rate reputation as a conductor. One visiting London critic considered him to have”stood as far above Wood and Beecham as Wood and Beecham stood above Stanford and Bridge.” Marshall-Hall was also a poet, a talent which was to be his downfall. After he published a collection of”immoral” and anti-clerical poetry, provocatively entitled Hymns Ancient & Modern, he lost his professorship. In 1914, a remorseful University rescinded its decision and invited him to return to his old post, but he was to serve for only another six months, dying of complications arising out of appendicitis in 1915. The Phantasy for horn and orchestra (track 11) was composed in 1905 for his friend and Principal Horn in his orchestra, Hermann Kühr. It is one of Marshall-Hall’s finest works, demonstrating an assured late-romantic lyricism, influenced by both Wagner and Brahms, but with a deft handling of orchestral colour and an unmistakable individuality. It was later adapted by the composer to serve as entr’acte music for his one-act opera Stella (1907). Like Marshall-Hall, Charles Koechlin’s life was also eventful and beset with setbacks. Born in Paris in 1867, Koechlin entered the Paris Conservatoire in 1890, studying composition first with Massenet and later with Fauré. It was the latter’s music which influenced him the most, reflected in his music’s similar combination of late romantic intensity with classical restraint. The first performance of Koechlin’s Poème Op.70b for horn and orchestra (tracks 5−7) was given on 24 March 1927 by Édouard Vuillermoz, one of Brémond’s successors as horn professor at the Paris Conservatoire. An orchestration of the horn sonata (1918–25), the composer’s expectation was that the solo part of Poème be performed obbligato within the orchestra by its Principal Horn. Koechlin also said that the work was “not a descriptive composition”, although the first two movements were “set in the atmosphere of the Romantic forest of Weber or Heinrich Heine” and that the finale had a “certain ambience marine”. 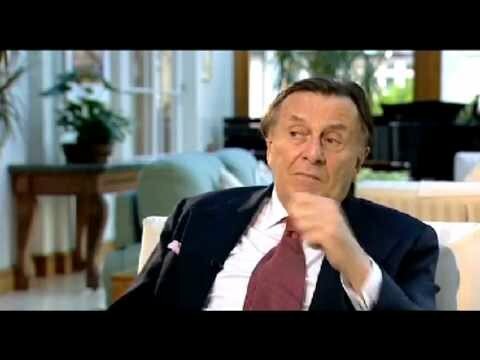 The influence of the sea is also evident in the Rhapsodie, (track 8) which Jean-Michel Damase wrote in response to a request from Barry Humphries. In his program note for the first performance, Damase noted that Humphries had asked for the work to be “inspired by the ocean and the atmosphere of the coast” and had specified that it should be written for performance by Barry Tuckwell. The result is a piece in a free form which depicts the “passing of a day: peaceful for dawn and dusk, with a more animated central section” and whose “extremely difficult” solo part exploits Tuckwell’s virtuosity, making the most of the instrument’s “heroic character” as well as its ability to play everything “from long melodic lines to passages of the greatest rapidity”. Barry Tuckwell gave the first performance at London’s Royal Festival Hall on 16 April 1986 with the London Symphony Orchestra, under Michel Plasson. The dramatic potential of the horn is equally apparent in the concerto (tracks 1−4), which Damase wrote eight years later. This adopts a more traditional four-movement form with a lively first movement followed by a rhythmic scherzo, a melodic andante and an up-beat finale. It was performed for the first time by Michel Garçin-Marrou with members of the Orchestre National Bordeaux Aquitaine at an international gathering of horn players in Bordeaux in July 1995.